Date stamps can be made self inking or non self inking. Date Stamps can be used to mark invoice and other such documents. They can be custom made as per your needs or be basic, with simply the month day and year. Self inking Date Stamps with changeable dates. Changeable Date Stamps that are used with ink pads. 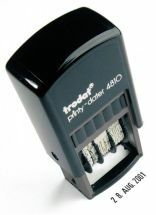 Printy Dater 7/8 in. x 1-1/2 in. 2360 Dater 1-11/64 in. x 1-11/16 in. 2460 Dater 15/16 x 2-1/8 in. 2660 Dater 1-5/16 in. x 2-3/16 in. 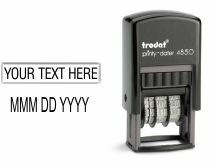 Customize your Trodat Printy 4850 Date stamp 7/8 in. x 3/16 in. Round Self Inking Dater 1-3/4 in. 2860 Dater 1-13/16 in. x 2-1/2 in.